Even with the seemingly long winter finally winding down, there is still time for many to enjoy outdoor activities the colder season has to offer. Snowmobile riding, for example, can be a lot fun. But it can also be dangerous. Because many people do not own a snowmobile, accidents often involve rented equipment and riders with little or no experience. According to a recent news article from the Sun Journal, a couple from Massachusetts was involved in a snowmobile accident when their machine was unable to make a sharp curve and ran into a large tree. The 66-year-old husband and 64-year-old wife were riding a rented snowmobile on a mountain in Maine. After hitting the tree, both riders were injured an required immediate medical attention. 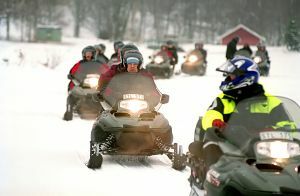 Due to the remote location, first responders rode their own snowmobiles to the accident scene to assist the two victims. A medical evacuation helicopter was called to the scene to fly the male victim to the nearest level one trauma center for immediate treatment. His wife was put in a sled attached to an EMS worker’s snowmobile and taken down the mountain, so a waiting ambulance could transport her to a local emergency room. She suffered a shoulder injury in the crash. Her husband suffered broken bones and possible other injuries that were not known at the time of initial reports. Some activities, such as snowmobile riding in the winter or using a personal watercraft (Jet Ski or Waverunner) in the summer, are inherently dangerous activities. There is no question participants assume some risk when engaging in these activities, and if an accident occurs during normal use of working equipment, there may not be a good case against the rental operator or vehicle manufacturer. However, if the accident was a result of defective vehicle or improperly maintained rental vehicle, there may be a valid claim. Additionally, if the accident would not have occurred if victims had been properly warned of a known danger, there may be valid personal injury case. In other words, assumption of risk may be a valid defense by defendants in these types of cases, as one can only assume risks they know about or have reason to know about. In order to understand assumption of risk, it is easier to look at an example involving an intentional tort such as battery. As our Boston personal injury attorneys can explain, civil battery is defined as an offensive touching of another without permission. If you decide to play a tackle football game, you know there is significant risk someone will hit you during the game. You may be tackled and that could lead to a broken leg. While a person on the street could not evade liability if they tackled and injured you for no reason, you have assumed this risk when you decided to play tackle football. However, if one of the players was wearing brass knuckles and punched you during the game, this would not be a risk you assumed, so you would still have a case. In other words, you did not knowingly assume that risk. When you rent a snowmobile, you assume you could fall off or hit a tree and get injured. If however, if you were not told that if you put your leg on a certain part of the snowmobile you could be seriously injured, you couldn’t be said to have assumed that risk ,if such risk is not common knowledge of renters of snowmobiles with little or no experience.